The humpback whale is a sizable sea mammal weighing in at 40-50 tons, and measuring up to 50 feet in length, however it is not the largest in the marine animal kingdom. The distinguishing hump on the back of the whale, seen only when the creature surfaces for air and then dives, sets it apart from other marine mammals in the animal kingdom. 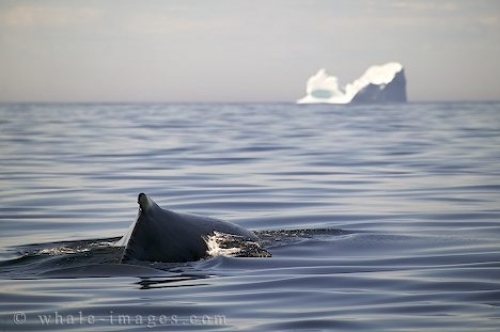 Picture of a swimming Humpback Whale and an Iceberg in the background.